Radiochemist Art Gelis observes technician Kevin Quigley preparing to cut open a surrogate uranium target. Argonne designed and built a Remote Handling Mockup Facility to let engineers simulate the handling of radioactive materials in a non-radioactive environment. The ability to carry out the details of an experiment ahead of time lets engineers streamline and tailor processes and procedures, saving a great deal of time and expense during the actual experiment. The facility has two robotic-arm manipulators that allow an operator to "mock up" equipment to ensure that it can be used remotely. Engineers can measure a specific shielded cell facility—window, table top, and entrance port—and reproduce it. "This means we can design equipment that not only fits into that particular cell but can be remotely assembled and operated in it," says Art Gelis, who oversees process development. "It's invaluable to be able to work out problems with equipment before it is actually inserted into a hot cell facility." In the course of refining the procedures, engineers often call upon their inventive skills to design specialized pieces of equipment to get the job done in the most effective way. 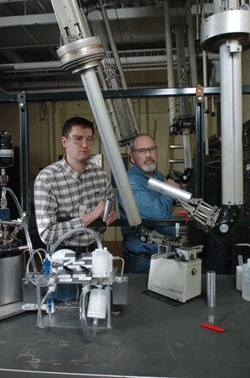 Recently, for example, Argonne's engineers needed to design a system to digest uranium and remotely move the resulting slurry through a system of filters and resin columns. The real challenge came when the engineers learned that the only opening into the shielded facility was through a 10-inch round port. All of the equipment had to be designed to fit through the port and be assembled remotely. Engineers are aided in such situations by Argonne's Central Shops, a state-of-the-art manufacturing and machining facility that can meet unique experimental and inspection needs.